One month after a deadly shooting shattered the rural silence of Chipman, Alta., the people who live there are still trying to make sense of the tragedy. One month after the sound of a shotgun shattered the rural silence of Chipman, Alta., the people who live there are searching for answers. 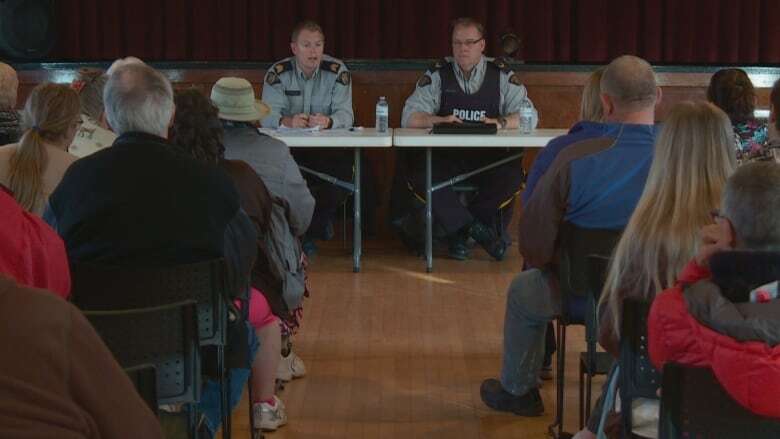 On Friday, 50 of Chipman's 270 residents gathered in the local dance hall to raise their safety concerns with police after a double homicide shook the village in early April. Terry Sutton, 39, and his best friend Jason Williams, 40, died after Sutton's neighbour, Raymond Nickerson, shot both men on April 2, police said. Nickerson, 36, was charged with two counts of second-degree murder. Sutton and Williams died on his doorstep in what police described as a non-random incident. It's the second shooting in Chipman in less than a year. 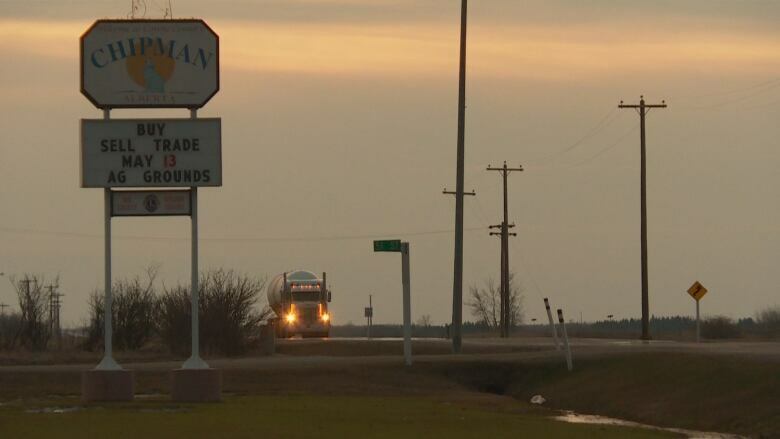 Last May, in an unconnected crime, another man suffered serious injuries after being shot outside a different home in the tiny village, which is just off Highway 15 about 60 kilometres east of Edmonton. Keiron Willis described the Friday meeting as a desperate attempt by the community to regain its sense of safety. Her best friend was widowed in the most recent shooting. "I have a best friend who has no husband, no friend, her children have no father," Willis said. "I want to do everything I can to help my friend and her family and this community." Willis, who was born in Chipman, said fear has taken root in her hometown. "The whole innocence of this village is gone," she said. "People move out here because they want to escape the violence that is in the bigger cities. The whole innocence of this village is gone. - Keiron Willis, resident of Chipman , Alta . She traced the problem back several years, when Nickerson and his family moved to Chipman. Since then, Willis said many of her friends have been plagued by neighbourhood conflict. "Chipman's always been very special to me and it just hurts that these people can come in and do this," she said. "It's just not fair." Two RCMP officers from Fort Saskatchewan led Friday's meeting. They refused to answer questions about the Nickerson household, instead addressing concerns such as police response times. After the meeting, Willis said she didn't think police went far enough to reassure a community living in fear and pain. She's especially worried about her widowed friend. "She's suffering because if something had been done beforehand, before it got to this circumstance, then we wouldn't be sitting here talking about this," Willis said. "It's not the cop's fault, there's only so much they can do," she added. "What the solution is, I don't know." Chipman mayor Jim Palmer, who was in Arizona when the shooting happened, returned in time for Friday's meeting. "We have a very good plan for preparedness but it doesn't include gun battles," he told his village, before addressing allegations against the Nickerson household. "We have absolutely no legal right to say who's going to move to town and who we're going to kick out of town — if we did, it would look a lot different." Palmer, who has been Chipman's mayor for 25 years, lives near the shooting scene. During the meeting, Rose Frobel expressed her dissatisfaction with the responses from Palmer and police. "At what point can I feel safe?" demanded Frobel, who lives next to Nickerson's house. Frobel and her husband, Erich, have gone to court over issues with their neighbour. On April 6, they showed a CBC reporter bullet holes in the fence surrounding their home. "That woman threatened to put me in a body bag," Rose Frobel told RCMP at Friday's meeting, referring to Nickerson's partner, who still lives near Chipman. "I don't feel safe," she added. John Stribling, a long-time village councillor, followed Frobel's statements to RCMP with his own. He also raised concerns about the police response to calls from Chipman. "When something is reported, nothing is ever done about it," he said. "What can we do to replace you here?" Others complained about noise from late-night parties and ATV rides. RCMP Staff Sgt. 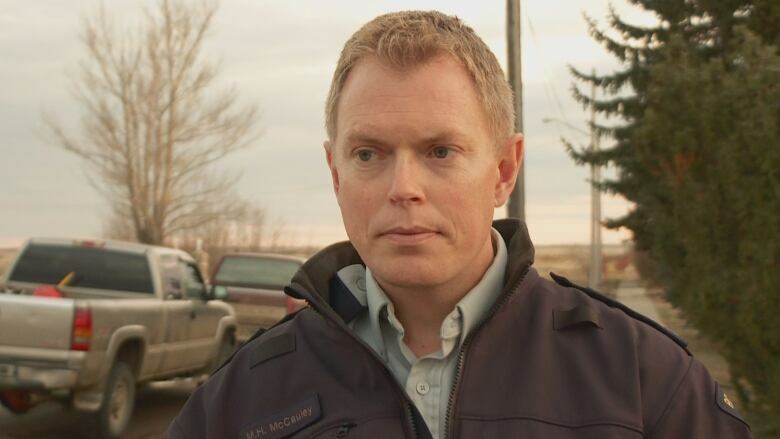 Michael McCauley is one of the RCMP officers who responded to the deadly shooting on April 2. He returned Friday to lead the meeting. "Frustrations abound," McCauley said afterwards. "While I empathize with them and don't blame them, I really try to explain to them that this was an isolated incident and unfortunately, as tragic as it is, this is not a crime-ridden community at all." Reports of crime in Chipman have dropped significantly from 2016 to 2017, he added. Last year, RCMP filed 134 calls for service from Chipman. In the first four months of 2017, there have been 20 calls. If that rate continues, the total number of calls by the end of this year would be 40 per cent lower than in 2016. "In a small village like Chipman it's personified and it's much worse," McCauley said about the double homicide. "Everyone's going to look to find answers and look to find blame when a tragedy occurs and this is no different." The village did not decide on any firm action at Friday's meeting, though suggestions of starting a neighbourhood watch were met with nods. Nickerson was scheduled to appear in court in Fort Saskatchewan on April 20, his second appearance since being charged with two counts of second-degree murder. His criminal record in Alberta consists of one other charge — assault with a weapon. He pleaded guilty to that charge in 2008 and served a one-year probation.